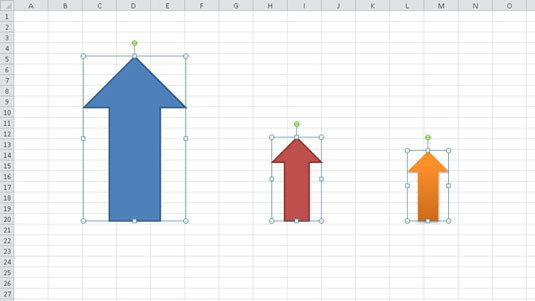 When you’re working with multiple objects or shapes in Excel 2010, you may need to align the objects in certain ways to improve their appearance in the worksheet. 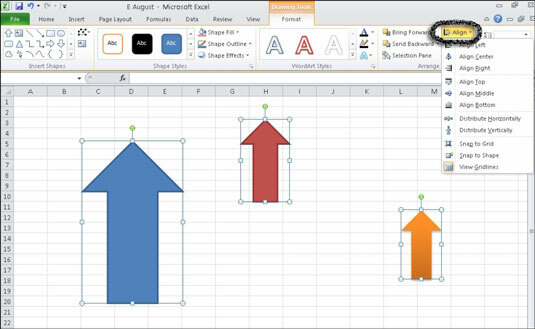 Excel provides several alignment options through the Align menu on the Drawing Tools Format tab. Select the first object and then hold down the Ctrl key and select the other objects. For assistance in selecting multiple objects, select one object, click the Drawing Tools Format tab, and then click the Selection Pane button in the Arrange group. You can Ctrl+click multiple graphics in the pane that appears on the right. On the Drawing Tools Format tab, click the Align button in the Arrange group. Select an alignment option from the Align drop-down menu. Align Left: Aligns two or more objects so their left edges are the same as the leftmost selected object. Align Center: Aligns two or more objects vertically through their centers. Align Right: Aligns two or more objects so their right edges are the same as the rightmost-selected object. Align Top: Aligns two or more objects so their top edges are the same as the highest-selected object. Align Middle: Aligns two or more objects horizontally through their middles. Align Bottom: Aligns two or more objects so their bottom edges are the same as the lowest-selected object. Distribute Horizontally: Aligns three or more objects so they are equally spaced horizontally. Distribute Vertically: Aligns three or more objects so they are equally spaced vertically. Snap to Grid: When active, using any of the align options aligns the objects to the closest grid intersection. When Snap to Grid is turned on, nudging an object with the arrow keys moves the object one gridline at a time. With Snap to Grid turned off, nudging an object moves it one pixel at a time. Snap to Shape: When active, aligns objects to gridlines that go through the horizontal and vertical edges of other objects. View Gridlines: Turns the gridline display off and on in the Excel worksheet. Three arrow objects aligned after choosing Align Bottom and Distribute Horizontally.